The year began with family and friends in a rainswept County Clare, Ireland, my home for 10 years. Many of the places I wanted to revisit and share were beneath meters of water. Things, of course, had changed for better and worse but the spirit of the land still shone through. Then more mountains and lakes, family and friends, as my brother’s path shifts to the Welsh borders, an area I have not visited before but will visit again. This time snow, ice, fog and sunshine accompanied my journey. Lake Vyrnwy reservoir submerged a Welsh village to supply England with water. And at ‘home’ the winter lashes the coastline, reshaping and reforming. Ilfracombe was originally named after King Alfred and was gifted to two of his sons as a sheltered harbour on the western approaches to his kingdom. Before then an iron-age hill fort overlooked the natural harbour from, what is now, Hillsborough nature reserve. This part of the North Devon coast is formed predominantly from Devonian slates, sandstones and shales and boasts some of the highest sea cliffs in England. We have a new studio here that we hope will provide a base for our creative endeavours and space for others to enjoy. In May, as part of the CCANW Soil Culture project, I led a walk and talk with the White Moose Gallery and supported by the Heritage Lottery Fund, to celebrate North Devon’s relationship with its earth resources. “Let’s Walk and Talk Dirt!” involved local potters, Harry Juniper and Roger Cockram, geologists Chris Cornford and Andrew Green, and soil scientist David Hogan to present some different perspectives about our local resources. Participants really enjoyed the interdisciplinary nature of the events but were frustrated by the lack of time to explore the subject matter in more depth. We are now working towards a ‘summer school’ to further explore North Devon’s potteries, pigments, rocks and soils. The Thelma Hulbert Gallery, Honiton, East Devon invited me in May, to run painting with earth workshops to accompany their ongoing Soil Culture exhibitions. The first workshop introduced the ideas to a small group of partially sighted children from the WESC Foundation, providing a space for us to enjoy the more than visual experience of the process and materials. I was also excited to be exploring a new area of the country, encouraging me to find new pigments and learn about their geology and history. The second workshop, for artists, included an invigorating morning field trip to Jacob’s Ladder beach in Sidmouth to gather small quantities of the iron-rich red and green mudstones, and whatever else took our fancy, followed by an afternoon of furious experimentation grinding and binding a selection of pigments with a variety of mediums. It was great to meet some new faces in such a lively and friendly gallery. Something that did surprise me was the presence of chalk in the landscape of East Devon. Having been raised in Portsmouth I am familiar with the chalk and flint of the South Downs and Isle of Wight but wasn’t aware of it so far west along the coast. The sedimentary Cretaceous beds at Beer, that I saw from Branscombe beach during a day of research, lie above Upper Greensand that then rests on the more familiar Mercian Triassic red mudstones of South Devon. Apparently there is an ‘unconformity’ here in that the interceding Jurassic layer is missing, the area being land during that era. The nodules of flint and chert present in the Chalk and Upper Greensand that make up the beaches are also apparent in the local architecture creating further similarities to the South Downs and other Chalk areas across Europe. One such region, that I also feel an affinity with through my ancestry and boyhood cycling adventures, is the Wessex Downs. The ancient country of Wessex encompassed Hampshire, west to the Cornish borders, and Wiltshire, Dorset, Devon and Somerset. In more recent times its character and characters have formed the backdrop for the literary works of Thomas Hardy. I was recently contacted by a research fellow from Exeter University to collaborate in a project to explore the value to health and well being of arts-based environmental workshops. His previous research looked at the work of Thomas Hardy in relation to the Wessex landscape. We are now waiting to see if our initial funding application has been successful before embarking on a major AHRC project around a similar theme. It has been fascinating working with a complete stranger towards a shared goal. Meanwhile, closer to home again we have been working with the local community towards re-landscaping an unsightly patch of ground behind the bus shelter in our village. It was good to be invited, to meet some more of our neighbours, to learn about the history of the village and to think how to we might alter such a space to celebrate the area. It was recently discovered that the area is owned (rather than it being public space) which has put the project back somewhat!? Beaten by both the need for storage space for my work and, hopefully, a more commercially viable product I have resorted, and returned, to making a number of small earth pigment paintings on paper. Originally I wanted to explore the layering and removal of water-based paint, similar to my past use of watercolour, using earth pigments. This worked well for one piece but I soon strayed back to the more recent pattern approach that working with earth pigments has inspired. My method, as in the past, allows the pigments, the colours, textures and forms, to suggest and reveal the form of the finished piece. It can often take a while for the painting to evolve, employing a variety of accumulated intuitive, mark making and aesthetic decisions and skills to move forward. Working in this way is always fascinating, offering outcomes beyond my present understandings. Each painting measures 21x21cm and is on 300gsm watercolour paper. The pigments, a selection of six hand ground, locally gathered colours from North Devon, have been simply mixed with water and then fixed with pastel fixative. I am now looking forward to making more simple paintings on paper of different sizes to develop this approach. The original paintings are available for sale online or later in the year at our new studio space at Hele Corn Mill, near Ilfracombe in North Devon. The Soil Culture project led by CCANW and RANE will be drawing to a close soon with its final exhibition at Peninsula Arts in Plymouth from 16th January to 19th March 2016[i]. The project as has been documented in a 120-page publication with essays by prominent soil scientists and soil artists, along with illustrated accounts of residencies and other activities enjoyed during the 3-years. My involvement in the project began when I met CCANW director Clive Adams in 2009. I presented him with six small glass pots of ground earth pigments from North Devon. He suggested I meet soil artist Dr Daro Montag at Falmouth University who was just starting an MA Art & Environment Course, which I subsequently attended. The publication is available from http://www.ccanw.co.uk/ at a price of £15 per copy. [i] Peninsula Arts Gallery, Roland Levinsky Building, Plymouth University, PL4 8AA. 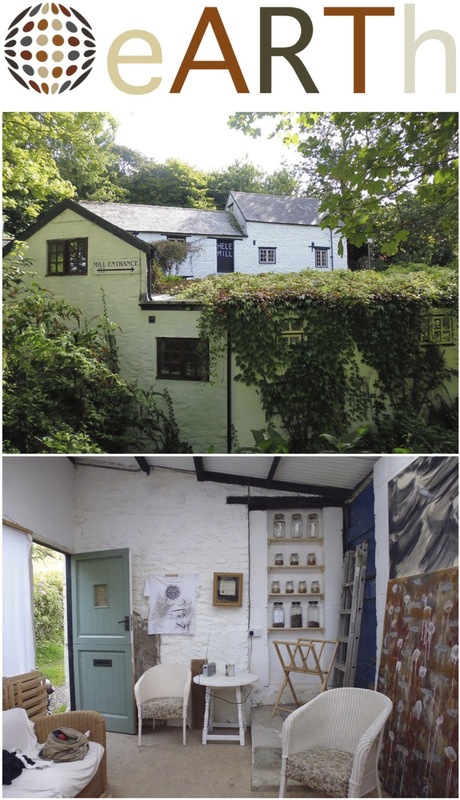 After an exciting first year, including a great exhibition at the White Moose Gallery, a number of successful workshops and OPEN STUDIOS and participation in other international projects, eARTh has relocated to a smaller, more rural space at Hele Corn Mill where we (myself and partner Francesca Owen) will be continuing our work with local earth pigments and plant dyes. Hele Corn Mill dates from 1525 and is a unique working watermill in North Devon. Located just 300m from stunning Hele Bay beach just east of Ilfracombe, a visit to the mill makes a perfect family visit. Opposite the mill is the Miller’s Wife Tearoom, where you can relax and enjoy a traditional cream tea or a slice of one of many delicious cakes, which are homemade every day. For directions, parking and opening times please visit www.helecornmill.com. You are warmly invited to a pre-Christmas opening – a chat, some nibbles, a glass of wine and some art. If you cannot make the opening please feel free to visit anytime. eARTh will be open on a regular basis along with workshops, exhibitions and events throughout the year and is looking forward to seeing you soon.